The Philadelphia City Council on Thursday apologized for the "virulent racism" that Jackie Robinson faced in the city and from its hometown baseball team nearly 70 years ago. Robinson, who broke Major League Baseball's color barrier in 1947, was viciously taunted by former Philadelphia Phillies manager Ben Chapman, as well as players, during his first season. In a scene captured in the film "42," Chapman led the bench in calling Robinson racial slurs and telling him to "go back to the cotton field." 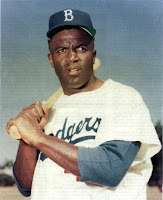 Robinson was also refused a room at a local hotel when the Dodgers came to play in Philadelphia that year. The city's governing body unanimously passed a resolution on Thursday declaring April 15, 2016, as a day "honoring the lifetime achievements and lasting influence" of Robinson and "apologizing for the racism he faced as a player while visiting Philadelphia." The resolution, which will be sent to Robinson's widow, Rachel Robinson.